Ealish Wilson is a textile artist originally from the UK, currently living and working in San Fransisco. Wilson's work is wide ranging, from mixed material sculptures incorporating everyday items such as zip ties, to intricately hand smocked digitally printed textiles. Wilson's work feels wonderfully tactile, playful and engaging. Wilson's found object collage sculptures are joyful and unexpected. Her use of bold color, and materials like plastic and Tyvek catch the viewers' attention. Her work celebrates pattern, and repetitive process. Combining traditional hand sewing techniques and new age, man made materials, the viewer is invited to see the juxapositon between old and new, handmade and industrial. 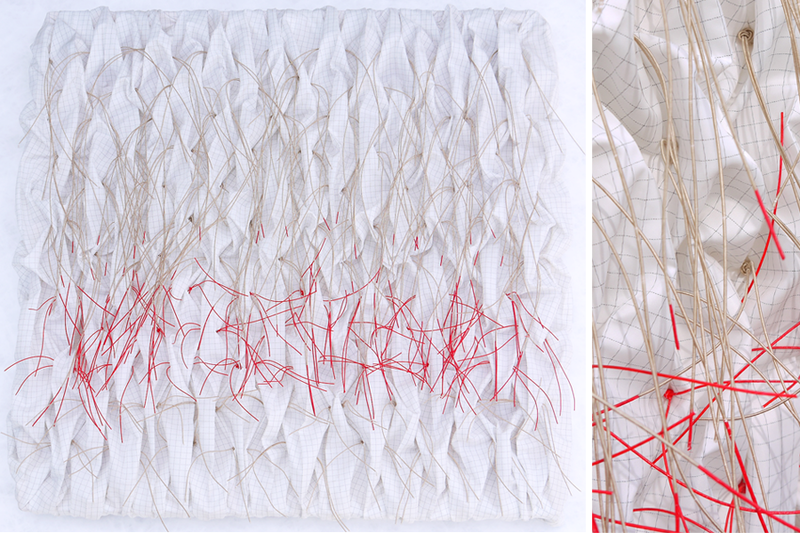 Beyond her wall pieces, Wilson experiments with her signature techniques (hand smocking) and materials (namely zip-ties) to create installation pieces and to play with useable objects, such as chairs, mirrors, bags, and outdoor canopies.